A look at the new book from Terri Griffith. I’ll admit to being a bit jaundiced at the multitude of management books out there ostensibly providing the ten steps to do this or the eight mistakes to avoid when doing that. It tires me—and it often neglects the environment. Such tactical books don’t exactly raise the level of discourse. I find that my favorite management texts don’t attempt to answer a bunch of questions and provide a how-to guide for every situation. Rather, they ask as many questions as they answer—if not more. 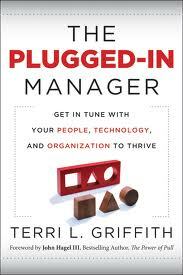 Against this backdrop, I heartily recommend Terri Griffith’s The Plugged-In Manager: Get in Tune with Your People, Technology, and Organization to Thrive (affiliate link). Rather than suggesting that you do “these five things” irrespective of situation, Dr. Griffith forces the reader to first examine the situation. I can think of no better advice these days than to stop and think before acting (although thinking too long is also fraught with peril). Case studies illustrate Griffith’s points throughout the book. The one on SouthWest Airlines is particularly instructive, as it illustrates the importance of marrying the right technology to the right process with the right people. As I’ve seen way too often in my career, focusing on technology at the expense of other key elements is a recipe for disaster. Even as a soloprenuer, I will benefit from the advice dispensed in the book. Double that for organizations. Get this book for employees trying to make sense out of an increasingly ambiguous world.